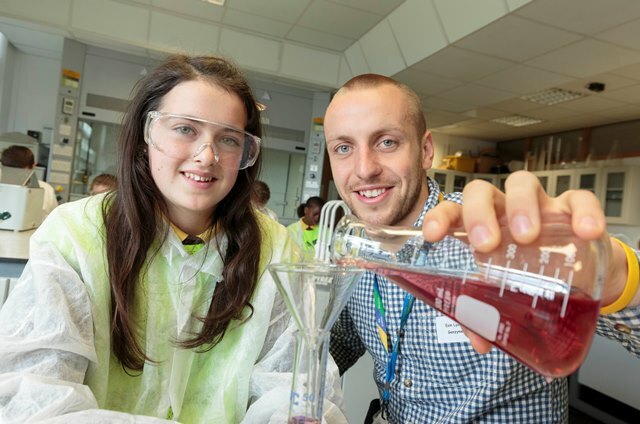 More than 160 pupils from six local primary schools are getting hands-on in the science labs at Waterford Institute of Technology (WIT) this week at a special two-day event designed to promote scientific study and careers. Now in its ninth year, Challenge Science was developed by Junior Achievement Ireland to introduce primary school pupils to a world of discovery and to make them more aware of exciting study and career opportunities in Ireland’s thriving science, engineering and technology sectors with many world-leading companies continuing to grow here. In Waterford, Challenge Science is delivered at WIT in partnership with Genzyme, a Sanofi Company, with 16 volunteers from the biopharmaceutical company’s Waterford campus leading hands-on workshops today (Wednesday) and tomorrow. This year, some 160 sixth class pupils from six local schools – St Stephen’s De La Salle; St John of God; Mount Sion; Our Lady of Mercy; St Mary’s and Waterpark – are taking part. Challenge Science sees the children aged 10-12 learn more about forensic science; famous scientists; biopharma and future study and career paths. Denise Power, Area Manager, South East, Junior Achievement Ireland, said: “It’s a terrific couple of days. The children really jump in to make the most of the workshops where there’s a real emphasis on getting hands-on and engaging with experiments. The whole idea is to show that science can be great fun rather than something hard to do. The workshops are also designed to have children working together to help dispel any myths about science being isolated solo work.